What Does it Mean to Be a School of Excellence? 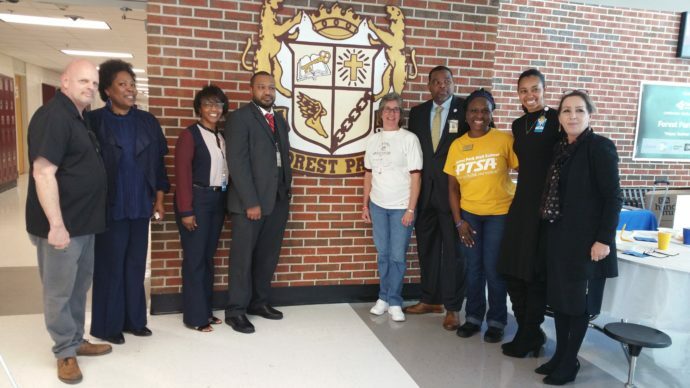 I had the pleasure of interviewing the Forest Park High School PTSA in Georgia about their experience in earning the 2017-2019 National PTA School of Excellence designation as well as the esteemed 2017 Phoebe Apperson Hearst Award of Merit. 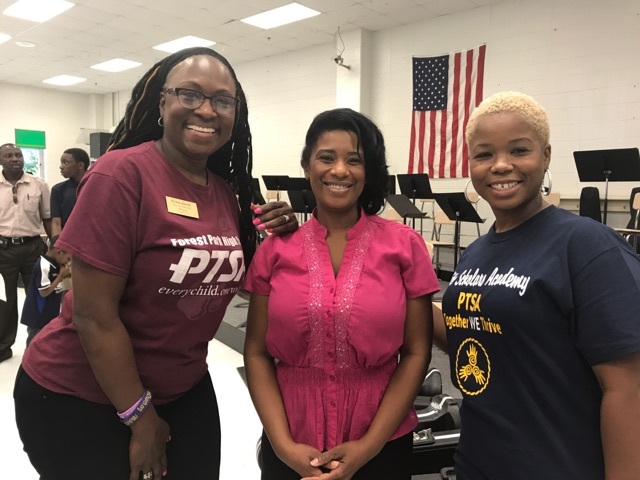 I chose to interview this PTSA to highlight their incredible story in growing their leadership from the ground up and becoming major change-makers at their extremely diverse, Title 1 High School. How did they do it? Lots of hard work, teamwork and love, with their school administration and community members behind them every step of the way. Hopefully, you will find their story as inspiring as I did! 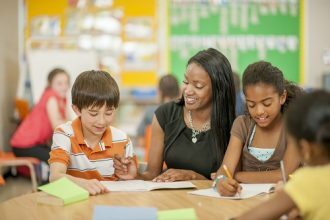 Tell us about yourself, your role in the PTSA and why you enrolled in the National PTA School of Excellence program? Arvis: I’m Arvis Walker, the proud Forest Park High School PTSA President and the mother of five wonderful children. My son is now a Junior at Forest Park High School. My motivation came from wanting to show our school and our community that we were worthy of such awards and prestigious recognitions and that we could do it…that we deserve it just as much as any school or county and to let our students know that they deserve it as well. Carolyn: I’m Carolyn Mitchell. I’m the Vice President of Forest Park High School PTSA and the mother of four children. 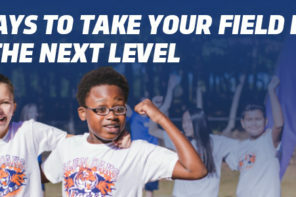 We enrolled in the National PTA School of Excellence program to enrich the educational experience at Forest Park and to implement a plan of action that would engage the parents, teachers and students at Forest Park. Tina: I’m Tina Mehler. I am an employee of Clayton County Public Schools and in my position as the Title 1 Community and Family Engagement Liaison at Forest Park High School one of my official duties is to actually be the liaison between the school and the PTSA. When I took over the position two-and-a-half years ago we didn’t have a PTSA. I thought having a PTSA in place is the most crucial facet of being well-positioned to increase family engagement, and the rest is history! We’ve been so successful in coming together and gaining buy-in from all parent and community members in Forest Park. Tell us a little about your student demographics? Arvis: Our school is probably one of the most diverse schools, if not the most diverse school in Clayton County, Georgia. The percentage goes as follows: 44% Hispanic/Latino, 42% African American, 10% Asian, 2% Caucasian and 2% biracial, so it’s very diverse. We have every aspect of the continent right here in at Forest Park High School. It’s a great group of students and we just love working with every last one of them. What would you say was your greatest accomplishment last year in having taken part in the School of Excellence program? 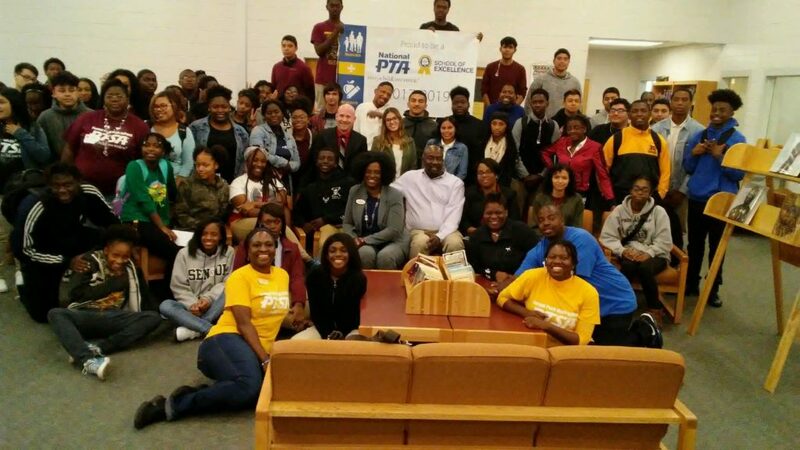 Arvis: I feel that one of our greatest accomplishments was educating our students, parents and our staff and faculty about the importance of PTSA. We had a long way to go. Our school didn’t know what PTSA stood for. We had to start from the ground up. We had to gain the trust of our administrative team, faculty, staff and our parents and students because they had never experienced it before. Also, learning to welcome all of our families. I’ll let Carolyn explain how we used information from one of the Chapter Leadership Training (CLT) sessions to find a way to help our team. Carolyn: At the CLT I went to a diversity culture session and met Isabel Sance with Mexican American Legal Defense and Educational Fund (MALDEF). She helped us to reach out, educate and engage our Hispanic families with what the PTA is and the structure of the school system. That completely increased our Hispanic involvement and presence at our meetings. Tina: With Isabel’s help, every Thursday we started doing a parent lunch and learn in Spanish from 10 a.m. to 1 p.m. with the Hispanic Parents Involvement Committee. Parents felt their voices were important, their children were important. And once they felt that, I think that they just got empowered to say what was on their mind and give us their perspective of how things are going in the school. Because of that, the trickle-down effect is that the kids learned more about the system—exactly what needs to happen—is parents are going home and talking about school at home. 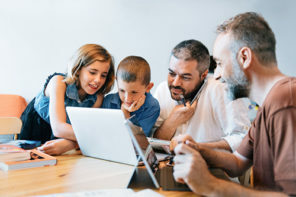 The biggest thing they’ve learned is how the system operates, what their place is in the system, who’s who within the district and at the school level, who they can go to for help for big things and small things, and how to talk to their kids about the school system in general and how to make their way. Our goal always at the High School level is graduation in four years. So, they’ve learned that. The next big thing is they’ve learned all of the options. What is dual-enrollment? Can my child do that? What are AP classes? What are honors classes? What kind of classes are available? What is career technical education? All kinds of things. Again, every week it’s a different topic and they are excited to come in on Thursday mornings. We invite everybody to come and if they don’t speak Spanish, I could translate for them and handouts are provided in two languages. Arvis: Seeing this accomplishment grow and seeing these families feel so welcomed in the Hispanic Parent Involvement Committee is the best feeling. Even when we are outside of the school at community events, we run to one another. We feel the love and connection amongst one another. What were your biggest barriers through the School of Excellence program and how did you overcome them? Arvis: I’m going to stay positive because that’s what we thrive on, but I think some of our greatest barriers were just getting an understanding about the importance about the program and what the program is. We were doing it for our students and our entire school and our community, trying to bring awareness to our community and let our kids know that they deserve greatness. We overcame these barriers with lots of praying, lots of communication, lots of asking questions to people that didn’t mind answering our questions, seeking the help of our administrative team. Our Principal and our administrative team are amazing. We had meetings with Mr. Manning during the summer. We didn’t get prepared once school got started. Overcoming barriers, you just have to go beyond, beyond—you can’t plant a plant and expect it to grow in a day, you’ve got to plant that seed and water it, and that’s what we did. Carolyn: Hours and hours of long meetings before school started, during the summer with our Principal, Mr. Manning—coming up with a game plan. We didn’t know if it was going to work. Mr. Manning being there, saying yes to every idea and plan we came up with really helped us succeed with all of the events and membership drives we had throughout the year. Do you think it was harder for Forest Park High School to earn the School of Excellence designation being a Title 1 school? Arvis: I do feel like we were probably an underdog but I like being an underdog because I’m a very competitive person and it will push me. Personally, I think they should take the labels off. The Title 1 label is almost a negative connotation that makes people think we’re less than. Everyone always asks are you a Title 1 school and I say, “No, we’re a High School.” It’s all in the power that you have within. If you feel like you’re not worthy, then of course you’re not worthy. But we never felt that we were not worthy. Tina: The Title 1 designation comes from the federal methods of extra funding to meet the needs of districts that need to bridge the gap between haves and have nots. Our whole district is a Title 1 district in Georgia, so it’s not just our school. 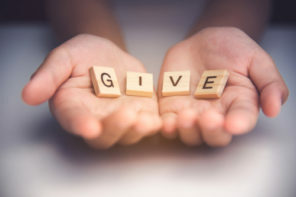 In any case, Title 1 does have its connotations—negative to some degree— but also positive because people know that there is extra funding available in the district for special programs to meet the needs of special populations. But, I think that one of the barriers we had was that we had to gain peoples’ interest, gain the teachers’ buy-in. We needed them to be members, we needed the students to know what the organization can provide for them, we needed the community to know that we are a real thing. This is a regular school with a regular PTSA. We welcome parents. We welcome all of the community. If you have a child there, you are welcomed parent, grandparent or guardian. We had so much on our plate at first, but by the second year, everybody was really celebrating us. Community sponsors were handing Arvis checks wanting to make a donation. The Forest Park community was all about our High School and this great PTSA. They saw that it was sorely missed and were just happy to be a partner with us and so much more as a fully functioning, welcoming-all-families school. They came to us asking how can we help. We had churches come. We have a volunteer who has a child in another high school who wants to be a part. Tell us about what it was like to be announced as a 2017-2019 National PTA School of Excellence and 2017 Phoebe Apperson Hearst merit winner. Arvis: We had received accolades from our students and parents and community and that was great. 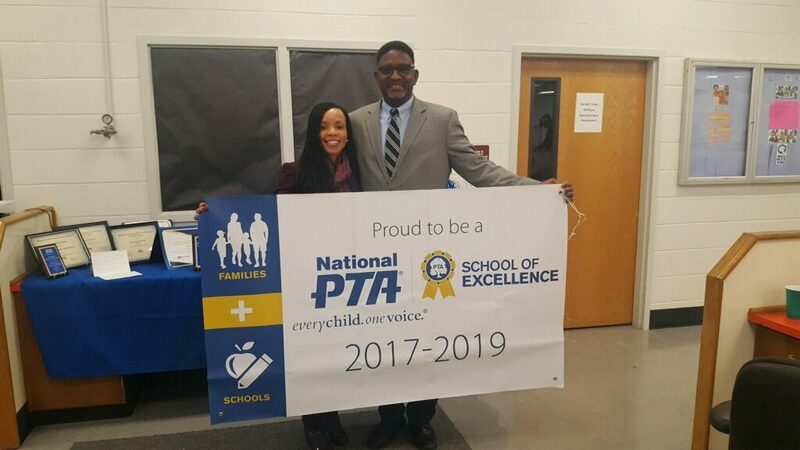 When I opened the School of Excellence acceptance email and congratulatory message from National PTA President Jim Accomando, I didn’t realize how much of an impact that it had on me personally. It was a feeling of success and pride, joy, excitement, happiness—all of that bottled in one. Then, I watched the Facebook Live for the Phoebe Apperson Hearst Award. In my mind, I thought this is probably not going to happen but just in case it does … When they turned over and said Forest Park High School, I think it just erupted. It was just a great feeling of joy and pride that our kids can say we are a national School of Excellence or a Phoebe Hearst award-winning school. And the teachers and administrators, just so that they can feel pride. It was great. It was a moment that compares to the moment I saw my first-born child. It was a great feeling. It’s something I’ll never forget. Amy: Even though you’ve earned the 2-year 2017-2019 School of Excellence designation, you reenrolled in the program again this year in hopes to earn the 2018-2020 designation. Why did you reenroll in the program and what do you hope to accomplish this year? Arvis: We enrolled again after we knew that we were a SOE award winner because that’s just our drive. We all go above and beyond, just like we push our students and children to go above and beyond. We got a lot accomplished but there is so much more but there is so much more to take care of. One of the goals we are working on now is to translate our signage in different languages to make all of our families feel welcome. Our principal is working with us on that as well. Not to have everything just in English from the outside, all the way to inside. I think participating in the School of Excellence program shows our students that even though we reached this level, there is so much further to go. Thank you, Arvis Walker and the amazing Excellence Team at Forest Park High School! You could not be a more deserving group for this national honor and we are so proud of your accomplishments. 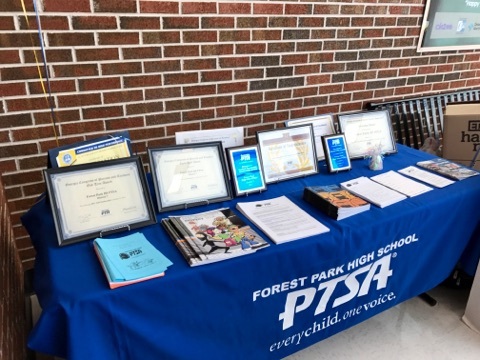 To learn more about Forest Park High School’s work, visit PTA.org/Hearst. To learn more and enroll in the School of Excellence program, visit PTA.org/Excellence or email Excellence@PTA.org. Amy Weinberg, MA is the Associate Manager of Programs & Partnerships at National PTA and serves as the primary contact for the School of Excellence program.